Distant view of Savendroog, two days march from Bangalore. 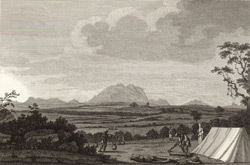 bl.uk > Online Gallery Home	> Online exhibitions	> Asia, Pacific and Africa Collections	> Distant view of Savendroog, two days march from Bangalore. Etching with line-engraving of a distant view of Savendroog by William Skelton (1763-1848) after sketches Robert Home (1752-1834) had made when he had accompanied the troops in Lord Cornwallis's campaign against Tipu Sultan in 1792. Plate 10 of Robert Home's 'Select Views in Mysore, the country of Tippoo Sultan' published in London in 1794.